Just days before the Memorial Day weekend unofficially kicks off the summer BBQ season, two major brands have recalled hundreds of thousands of ready-to-eat hot dog products. On Friday, distributor John Morrell and Co. announced the massive recall along with the USDA Food Safety Inspection Service (FSIS). According to the FSIS press release, the hot dogs may be contaminated with metal shards. This is a Class II recall with relatively low health risks. Nathan’s SKINLESS 8 BEEF FRANKS, 14 oz. Curtis BEEF MASTER Beef Franks, 16 oz. 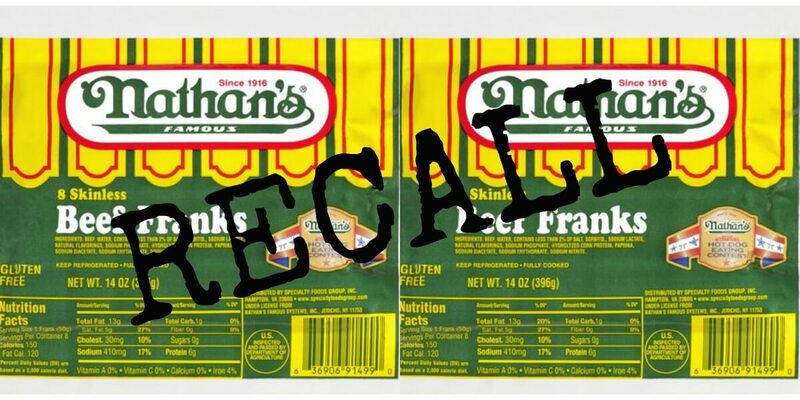 John Morrell produced the hot dogs on January 26, 2017, and the products’ “Use by” dates are August 19, 2017 (Nathan’s) and June 15, 2017 (Curtis). Both packages also bear the establishment number “EST. 296” on the side of the package. According to FSIS, John Morrell has recalled some 210,606 pounds of hot dog products. They state that they initiated the recall following three separate complaints from consumers identifying metal objects or shards inside the product’s package. FSIS also reports that there are currently no reports of injuries or adverse effects from these metal objects. Regardless, the USDA FSIS and John Morrell emphasize that because of the risk, consumers should not eat these hot dogs. Instead, the FSIS recommends throwing away the package or returning it to the original place of purchase. Consumers with questions or concerns may contact the distributor at 1 (877) 933-4625.